Last year’s bunny photos went better than this years. All leading up to the photo everything was cute and adorable. The perfect set up. Even starting with the parking. The lot was full. And I mean full. Every spot taken. Until we found this one. How awesome is this? Both Preston and Madison were excited to see the bunny. Even walked into the mall holding hands after Madison declared herself a princess and Preston grabbed her hand and said that he was the prince because princesses need a prince. We got to the bunny and while I chatted with the people working the area the kids played and danced around the Easter Bunny so excited to see him. Then it was time to climb up on his lap. But the photo, it was just not happening. They both wouldn’t smile. Or look. Or really pay attention. 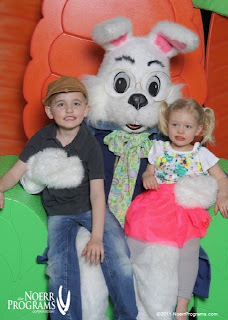 It was like we’d used up all the photos ops on the way to the bunny’s lap and now that we were here they were over it. It just got worse with each photo they took. We ended up with picking number two to have printed. This is the “best” one. We laughed about it and moved on. Definitely won’t be winning any prizes for greatest photo ever. Even if the kids in it are absolutely adorable…in every other photo but this overpriced one!